Mai senza smalto! 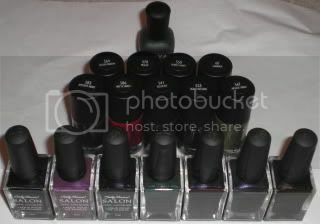 : PerryPie's Giveaway: 17 polishes and more! PerryPie's Giveaway: 17 polishes and more! Un altro giveaway! Come si tradurrà? Estrazione a sorte? In ogni caso, PerryPie lancia confetti :-) e mette in palio, per festeggiare i suoi primi 100 lettori, ben 17 smalti (Zoya, GOSH, Sally Hansen) e scraper/plate/stamper della Konad...E un braccialetto! Ad oggi è arrivata a 204, congratulazioni!! Cliccare sulla foto per partecipare, avete tempo fino al 28 Febbraio! Another giveaway (difficult to find the appropriate translation in Italian)! PerryPie is throwing confetti and offering, to celebrate her first 100 readers, 17 polishes (Zoya, GOSH, Sally Hansen) plus a Konad scraper/plate/stamper...And a small bracelet! So far she reached 204 followers, congratulations! Click on image to enter, deadline is 28th February.